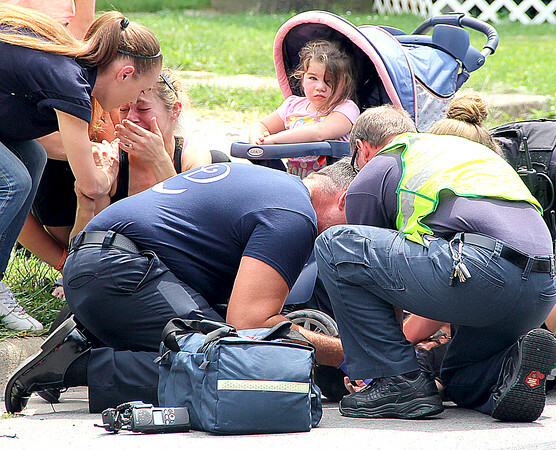 Emotional Moment: Hope Peters (left) is overcome with emotion as rescue workers attend to her son, Trevor Esterline, 6, in the early afternoon Friday in the 500 block of N. Lebanon St. Three witnesses said the boy darted from his mother and ran into the side of a silver Mitsubishi Mirage headed north, driven by 16-year-old Kindsey Robertson, Lebanon Police Lt. Scott Hood said. The car's right front quarterpanel took damage and the windshiled was cracked following the collision. "He went airborne and looked like he folded in half," said witness Pauletta Cooley. "I thought a car hit a dog." Hood said LPD officer Taylor Nielsen reported the boy was not conscious when she arrived. Esterline then "snapped" out of it, Hood said, and became conscious as medical personnell began to attend to him. The boy and mother were transported to Riley Children's Hospital in Indianapolis.